Though prices vary widely, experts suggest these options can help minimize damage to both the facility and the environment rock salt may cause. Another option for keeping snow and ice from accumulating, without relying on chemical de-icers, is to install heating elements below walkways, parking lots and other areas. The systems, which have been around since the 1940s, pump heated fluid through plastic pipes in a closed-loop system located below the sidewalks or other areas that need to remain clear of snow and ice, says Lance MacNevin, director of the engineering, building, and construction division with the Plastic Pipe Institute. Sensors on these hydronic systems measure moisture and temperature to determine when to activate. The sensors can turn on the boiler and pump to heat and circulate the fluid, a mix of water and antifreeze. MacNevin recommends propylene glycol anti-freeze, as it’s non-toxic. If environmental impact is a major consideration, facility managers should consider using ethylene glycol in lieu of propylene glycol, says Dave Guzlecki, senior project engineer with HGA. "The propylene glycol is more harmful, if leaked, to groundwater and to natural plant life due to its low biodegradation and high chemical oxygen demand," he says in an email. Just like an air conditioning system, a hydronic deicing system needs to be sized correctly. The optimal size will depend both on the climate and the types of snowfall the system must handle. For instance, a system for a school probably doesn’t need to handle every potential snowfall, given that classes often are canceled in extreme weather. On the other hand, the walkway in front of an emergency room likely will need to handle all levels of snowfall. Ideally, the piping is placed over a layer of insulation. That way, the heat is directed up to the concrete, rather than to the earth below, MacNevin says. The price tags for the systems can vary dramatically. The expenses for the boiler, the pump, and the controls tend to be relatively fixed. That’s why a smaller system can cost, on a per square foot basis, more than a larger one. 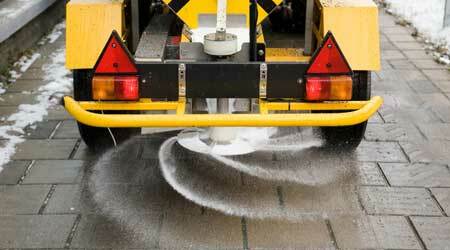 The payback versus traditional snow removal methods tends to range from about five to seven years, MacNevin says. Another option is snow-melting mats. “These mats consist of two layers of slip-proof rubber, a central heating element, and a fully grounded power cord,” according to literature from Heat Trak, a manufacturer of snow-melting mats. The mats can melt snow at a rate of up to two inches per hour, can be driven on, and are designed to be left outdoors all winter, according to Heat Trak. The mats can be turned on only during and following a storm to save energy, or can be left on longer to evaporate melt-off. Programmable external thermostats and remote controls can turn the mats on or off based on temperature and moisture levels. Karen Kroll, a contributing editor for Building Operating Management, has written extensively about real estate and facility issues.